Loanees Reece Meekums and Zack Newton are both set to feature for Worthing in tonight's Sussex Senior Cup tie with AFC Uckfield. The game gets underway at 7.45pm at Woodside Road and Worthing manager Adam Hinshelwood is set to field a strong line-up, with a blend of youth and experience, against their SCFL Premier Diivsion opponents. 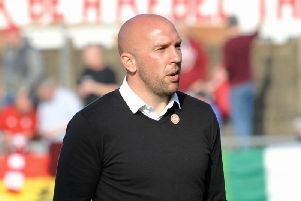 Meekums, who scored the winner against Folkestone on Saturday after returning to Worthing on loan from Bromley, and Newton, on loan from Welling, are both likely to play. The duo are unavailable for Saturday's FA Trophy tie with Chesham owing to the loan arrangements with their parent clubs and Hinshelwood said: "Reece and Zack are both available tonight, so it would be stupid not to give them minutes. That's why they've come on loan to us. "There's older bodies that need a rest and there will be some older bodies who need minutes tonight but I can't see us changing too much. "We'll assess who we've got available but I can't see there being ten changes from Saturday." With the final at the Amex, the Sussex Senior Cup is a competition Hinshelwood wants to do well in: "We want to give a good account of ourselves in all of the competitions we're in. We don't take any competition lightly, so it will be good to have a run in this one as well." As for the longer-term futures of Meekums and Newton, Hinshelwood would like to keep both for longer than the rest of this month. He said: "We'll get through the month and then reassess it. We'd like them to both stay for a longer period but they'll help us through this month as we've got a hectic schedule. "We've got lots of games in December as well, big games with a couple of Sussex derbies, so we'll just monitor it. We're hopeful there will be scope to extend them both." On bringing any more players in, Hinshelwood said: "There's not much room (with the budget) with the injuries and the likes of Lucas (Covolan) being out and getting Kleton (Perntreou) in. "It's a bit tight, there might be one or two who we'll look to go out the other way just to free things up a little bit and also they need to go and play." Alfie Young, Aarran Racine, Covolan, Joel Colbran and Ollie Pearce will all miss tonight's game but Hinshelwood is hopeful Colbran could be fit to return on Saturday.